The Deluxe Edition Now On Limited Edition Cassette Tape (only 100), includes 3 tracks not on the CD! 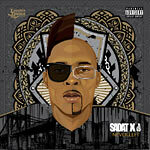 Never Left is an album that celebrates Sadat X's illustrious 25 year career. It is a cohesive collection of songs that make it a well-crafted, adult Hip-Hop album. Listeners are offered a sonic ride that feels familiar without being dated. ''Never Left'' captures the feeling of New York's Golden Era, carried forward 25 years by a man who has lived the culture to the fullest. Along the way Sadat stays in pockets with notable features by contemporaries like Black Rob, Cormega, King T, Skyzoo, Dres, Craig G & Chi-Ali. Overall, Never Left promises to surprise even the most loyal of fans while finding its way to new ones.